II Corinthians 3:17-18 is central to the Deeper Life. In the past I have told you to turn inward, to look inward for direction, for your values. I’ve written about the Image of God, the Spirit of God, and Conscience, to describe what’s within you, why you should look inward. But so far I haven’t discussed at all how to look inward, just the why, and what’s there to find. Among some Protestants this looking inward is one aspect of what’s called the Deeper Life. I remember feeling so impatient with my pastors when they would exhort me to pray more, to witness more, to be more Christ-like; telling me to be more committed, more dedicated, more patient, but never telling me how. I always felt that was a major weakness. When they never explained how, it made me wonder if they knew what they were talking about. I mean, I already wanted to do all those things, I already knew they were important. Why hammer away at what I already know if you’re not going to tell me how to do it, explain to me why it’s so hard, give me some direction? There are a couple of verses from Paul that zero in on what happens when you look inward, what happens to you. There are many other places where he describes mystical experiences, but to me this is the most useful one. It tells me what to do, why you do it, and what to expect. Here’s II Corinthians 3:17-18. Now the Lord is the Spirit, and where the Spirit of the Lord is,there is liberty. 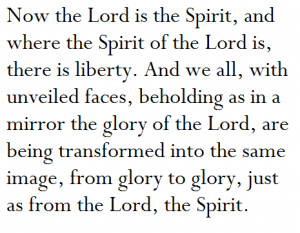 And we all, with unveiled faces, beholding as in a mirror the glory of the Lord, are being transformed into the same image from glory to glory, just as from the Lord, the Spirit. Paul doesn’t use the word “meditation” here, but I will for now. Most of this will sound familiar, but that’s okay. It’s still important to do, to actually do it. Sit alone in silence. You are not sitting in the presence of God, as though God were something separate from you. God is present. God is not present in you, the glory of God is present as you. Your face is unveiled, there is nothing between you and God. And when you behold the glory of the Lord, you are beholding that glory in a mirror. What do you see when you look in a mirror? Exactly. Part of your childhood involved looking in mirrors, and learning to recognize who you are. This occurs between six and eighteen months old. There’s a good introduction to this experience in the wikipedia article on the “Mirror Stage,” which you can read by clicking here. The Christian experience of beholding ourselves in the mirror should be among the essential things we’re taught in church. You need to look in that mirror to see who it is you really are. For some of us, this will seem absurd. But this is what looking in a mirror means, seeing your self. By looking in the mirror at the glory of the Lord for months and years, you will be transformed to ever-increasing glory. Yes, the word transformed is metamorphosis, caterpillar to butterfly. But that is not from bad to good, it’s from good to better and better. And in my book, better means more like the Lord, more like Jesus. It is the Lord, who is the Spirit, whose glory you behold when you look into that mirror. When you sit in silence, eyes closed, you are beholding the sheer presence of God within you. Nothing surpasses God. There is nothing more important you could contemplate, or “see with spiritual eyes,” than God. To be sure, if this is your first time, this beholding will be cerebral and intellectual, much like the conscious effort of a child learning to ride a bicycle. But you have to start somewhere. When we think about seeing ourselves in a mirror, we tend to focus on the negative. We remember the mistakes we’ve made and the people we’ve wounded, or the fools we’ve made of ourselves. The big question in this regard is this: Why are we preoccupied with stuff God has forgiven and forgotten? No matter how bad our past actions have been, we eventually need to get to the point where the past is the past, and leave it there. Memories of our past failures do serve to keep us humble, but when they prevent us from growing in grace, growing more Christ-like, then they are trespassing on territory where they have no right to be. Many different kinds of fruit will result from you beholding the glory of the Lord in the mirror. Chief among that fruit, based on this passage, is freedom, or liberty (eleutheria). To repeat: Sit alone in silence. You do not need to invite God to be present. God is already present. Your face is unveiled, there is nothing between you and God. God is not somewhere else. And when you behold the glory of the Lord, you are beholding that glory in a mirror. And what do you see when you look in a mirror? Precisely. In my next post I will discuss that cardinal virtue, liberty, and how it flows from beholding ourselves in the mirror. This entry was posted in Contemplative Prayer, Deeper Life, Devotional, Meditation, Mysticism. Bookmark the permalink. For me, the commandments of Jesus Christ outlined in the pages of the bible give the “how to” for “eternal life” to “know Thee, the one true God and Christ whom He sent”… as well as to understanding that the “kingdom of God is within you” as He states to those that were drawn of God to Him, to be disciplined followers of His words to them. Yes they are. The Bible is like a diamond, with truth gleaming from every facet. When I look at myself, as a manifestation of God, I see a humor-ridden, slightly sarcastic creature that tries too hard to put itself into the shoes of others. Yeah, that could easily describe God at times!